SB-8700 will seal and enhance the beauty of new and old concrete, masonry and related surfaces. 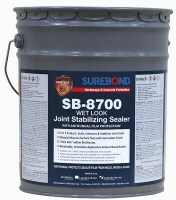 In addition, SB-8700 will stablize the joint sand creating a long lasting hardened joint. It is ideal for Interlocking concrete pavers, stamped concrete, or masonry surfaces giving them an enhanced, wet look, glossy finish. SB-8700 is the perfect product to restore the look and elegance of old/tired pavers. Also works on limestone, sandstone, clay and natural stones. 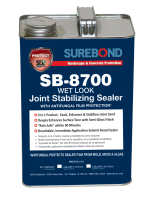 What makes SB-8700 Wet Look Joint Stablizing Sealer different? Water Repellant/Rain Safe - Water repellent qualities and “Rain Safe” within 90 min.